Behold, my recently completed terrain board! This is the surface on which I will be playing with my miniatures. I suppose I have space to build a permanent gaming table in my basement, but for now I intend to game on the dining room table. I started with a 25.5 x 25.5 in piece of hardboard. This is a man-made product composed of compressed wood fibers. I bought a huge sheet (something like 4 x 6 feet) for about $11. A more economical choice would be to find a scrap piece of plywood. There's always a bin of cheap scraps by the saw at your local home improvement store. I picked the hardboard, because it's easy to cut with a utility knife or handsaw. I know I'll be using the srcaps as bases for hills, buildings, forests, etc. The guy at the home improvement center cut the board for me. He must have been new to the saw, because one of his cuts set a piece of board flying across the room. Fortunately, it slammed into a box of scrap wood, rather than continuing on to hurt some one. I beveled the edges with a utility knife to give more of a rough-hewn look. Next, my 6-year-old daughter and I glued on sand for a textured surface. I squirted white glue on the board, brushed it to even it out, and she poured on the sand. We worked on a large sheet of paper, so the excess sand could be poured easily back into the container. I used to live near the beach, where sand is plentiful and free. I am land-locked now, but have just realized I can swipe some sand from a playground sandbox. You can buy sand at the hobby store, but why would you? The next step was to paint the board brown. At this stage I suggest you spray-paint the surface with matte black paint. Spray paint doesn't soak into the board as much as brushed-on acrylic, so it would be a good way to avoid warping. I thought the 1/4 in. board would be thick enough to hold its shape, but I was wrong. My daughters helped me paint the sanded surface (without priming with spray paint). The board soon buckled and curled. I had heard that painting the other side would prevent this (it's the wet side fighting with the dry side that creates curling), so I painted the back and placed a heavy radio and a log on top to flatten it down. Thankfully, the next day it was fine. I'm sure spray painting would have helped, but a sure-fire way to avoid buckling would be to use plywood. I don't think smaller pieces of hardboard will suffer so much from this problem, so my scraps should be a-ok for making terrain pieces. Once the brown paint was dry I bushed on areas of differing shades of green. 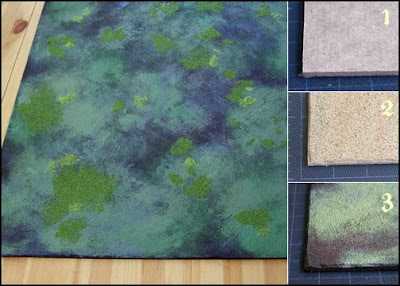 Using the same brown to mix in to the green is a good way to ensure that the colors look good together. To finish the board my daughter and I glued on patches of flock (green dyed sawdust) and static grass (tiny green plastic hairs). My new game of choice, Song of Blades and Heroes, recommends a minimum playing area of 90 x 90 cm if using 25/28mm models (which I am). To start out, however, I decided to make a smaller board. This one is 64.5 cm square (25.5 in.) I think leaning the rules will be easier if I play in a more confined space. I figure this will minimize movement, and maximize fighting between models. My board is still larger than the smallest suggested size of 60 x 60 cm, although those dimensions are intended for those playing with 15mm models. After learning the game I may keep using this board, or I may move on to a cloth matt at the 90cm size.